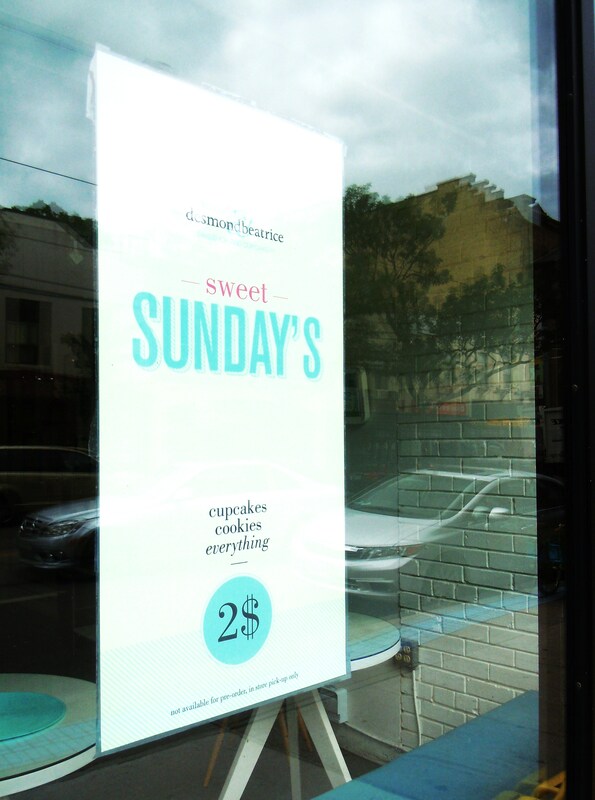 Tag Archives: Queen Street East & Broadview Ave.
Sundays Just Got a Whole Lot Sweeter – The $2 Cupcake, Tart, Square, & Cookie Bonanza at Desmond & Beatrice! You might think of Sundays as quiet, peaceful, lazy days. Many shop owners choose Sunday to have their day off, traffic on the road is a little lighter save for the long weekends, and places aren’t open as late as they are during the rest of the week. 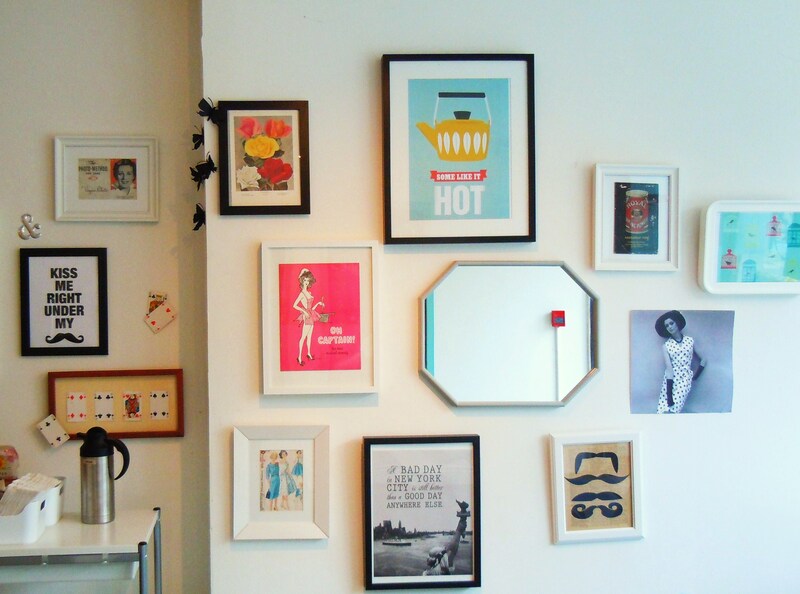 At Desmond & Beatrice on Queen Street East in Riverside though, Sundays might as well be the new Friday! *NEWS BULLENTIN* Sundays at D&B are $2 bonanza days! $2 cupcakes, $2 tarts and squares, $2 EVERYTHING! Everything on their edible display counter anyway; no way are we getting away with cute $2 aprons! I have no idea how long D&B has had this promotion (*note to self: ask next time! ), but boy does it get people extra kooky-crazy for their delectable, delightful desserts! It sure did that to me. I passed by their bake shop before they had opened, glanced at the front window, and almost got whiplash when I whipped around to make sure I wasn’t hallucinating. $2 Sundays?! No speciality cupcakery with the exception of Dessert Lady in Yorkville, who sells their vanilla and chocolate ones for $2, sells their wares for that price. And apparently, I was a little late to the party because when I came back when they were open later on in the day, they had been wiped clean! The only thing that greeted me was a dish of peanut butter and banana cupcakes. I should have known better. Sundays might be a little on the quieter side (although you’d never know it taking the bus; it is crowded and packed early in the morning! And by “early”, I mean 9am by bus schedule standards), but so many people are out and about in the city, whether it’s for a festival, a sporting event, a concert, or just good old fashioned weekend brunch. Anyway, lucky for me, D&B had enough sense and hindsight to keep their delicious cupcakes coming and before I knew it, full, fresh, beautiful batches of red velvet, vanilla, and double chocolate were before me, waiting to be chosen like the crown jewel in a treasure chest. And my precious cupcake of choice this time? Double chocolate! 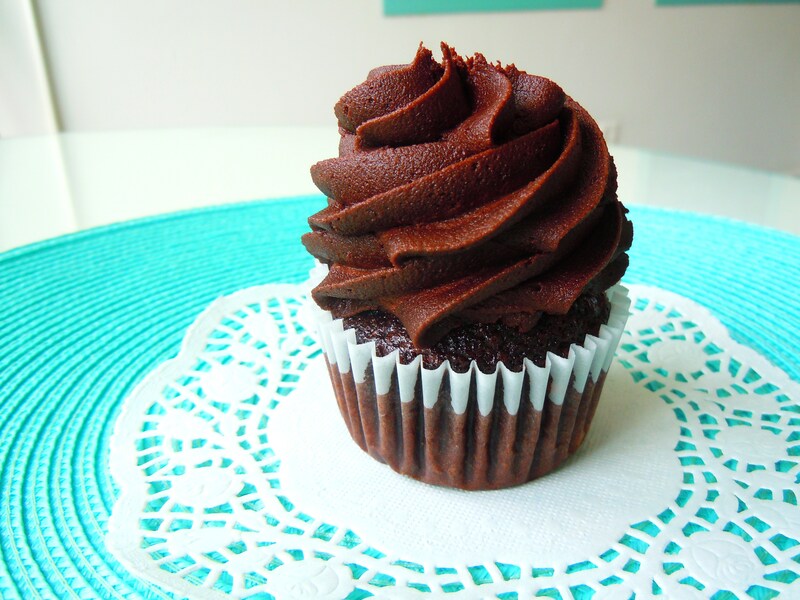 If you can believe it, chocolate cupcakes with chocolate frosting are something I don’t have very often. If you were to go through my eleventy billion cupcake posts on the blog, you’d find less than 5 devoted to chocolate on chocolate. And it’s not because I don’t like chocolate – I love chocolate! 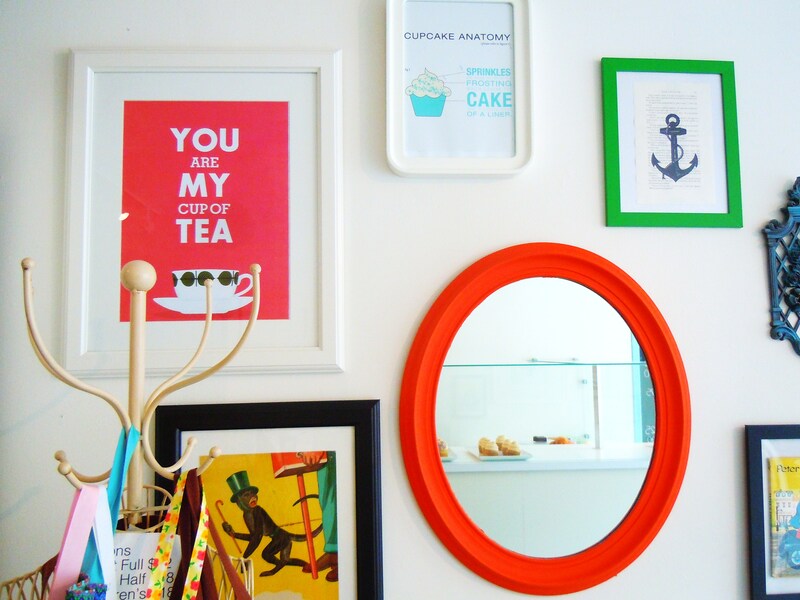 It’s simply because I want to paint a more diversified portrait of the cupcake flavours available in the city and now that I have a steady foundation of posts (I believe this post here will be Cupcake Chronicles’ 90th! ), I can feature more classic flavours here and there to round things out. 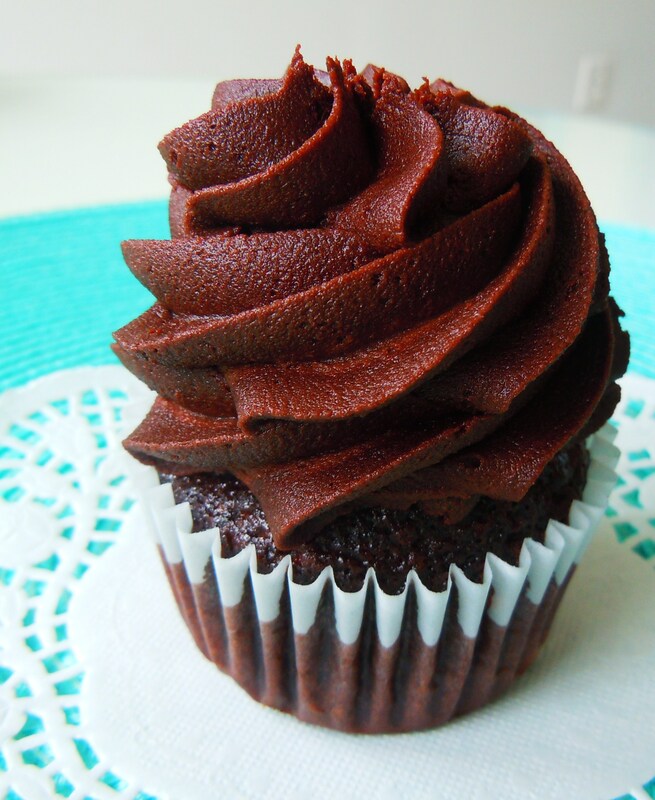 This double chocolate cupcake post is inspired and dedicated in part to both my boyfriend and my brother, two chocolate lovers whom I hold very dear to me, and given how my brother can take or leave cupcakes, I’m determined to find him the best of the best to really wow him. 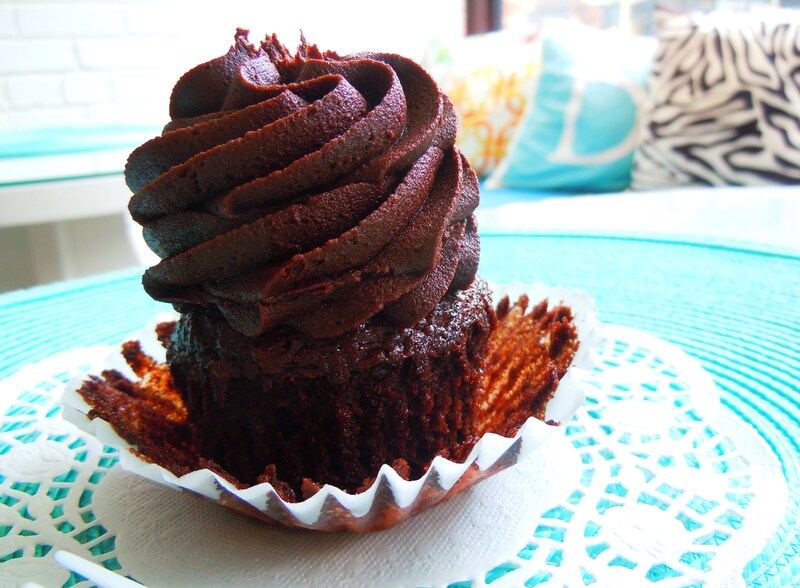 And this one right here from Desmond & Beatrice has to belong on everyone’s Top 3 Most Amazing Chocolate Cupcakes because it is out of this world and RIDONKULOUS. Yes, that’s right, ridonkulous. 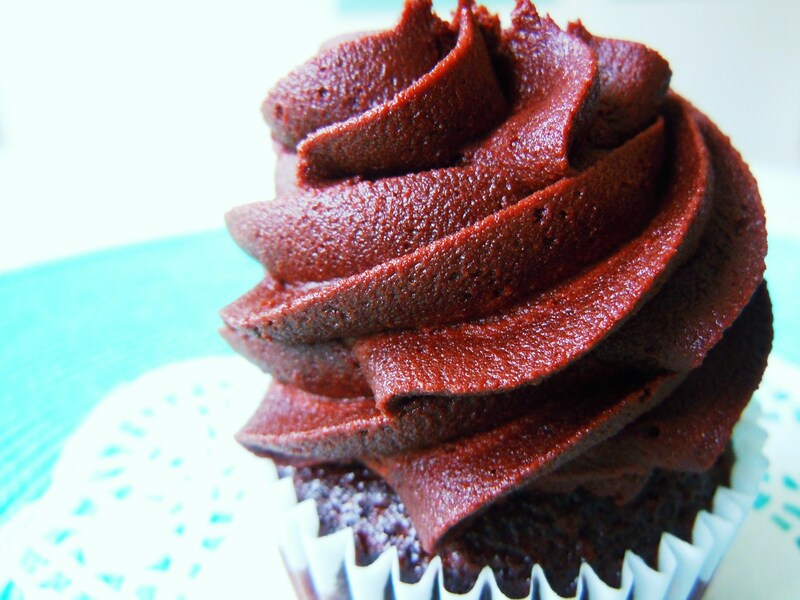 Chocolate cupcakes are either really great or really bad. Some can fall in the so-so category, but more often than not, they’re love it or hate it. Some are way too dry, too powdery (a little too much of that cocoa powder taste), or too dense to the point where it just tastes like thick, goopy chocolate muck. 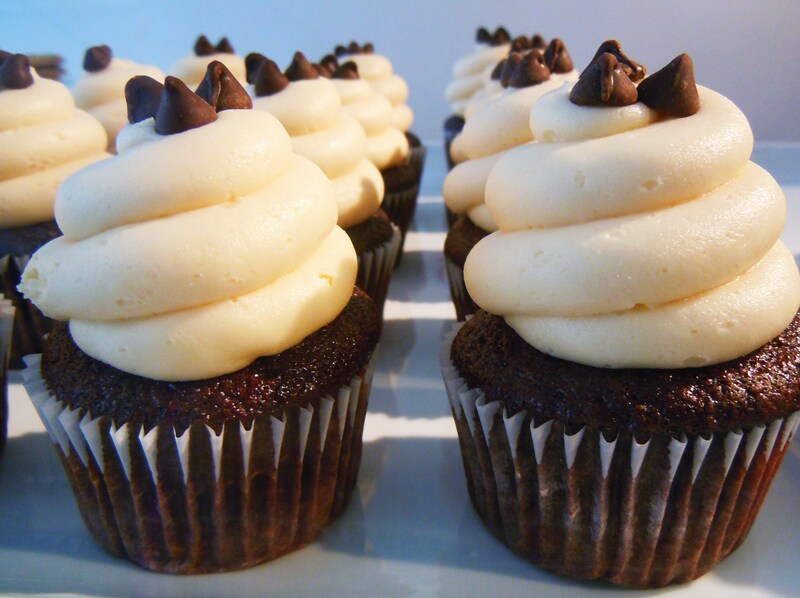 D&B’s amazing double chocolate delight is what EVERY chocolate cupcake should aspire to be like. I was shocked out of my skirt because I couldn’t believe how damn delicious this was! It is a fudgy, creamy embodiment of a brownie in cupake form. It tastes like chocolate brownie fudge with fluffy cake. It is so moist, so creamy and so decadent. The frosing is as smooth as it gets and eating it with a fork makes you feel like you’re digging into a special chocolate birthday cake with, quite possibly, some of the best chocolate frosting in the world. 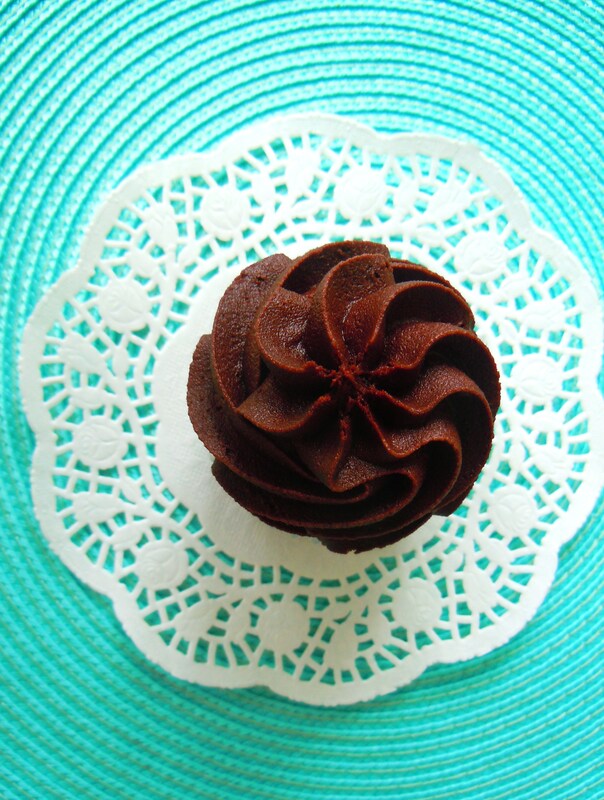 If you’re head over heels over brownies, this cupcake is the answer to your prayers, in addition to D&B’s crazy $2 Sunday sale! I don’t think anybody needs an incentive to go to D&B, but this promotion sure is a mighty sweet deal so take advantage of it if you’re in the area! Desmond & Beatrice Bake Shop and Cupcakery is located at 750 Queen Street East, just one block east of Broadview Ave. in the Riverside District. They are open from Tuesday-Sunday (closed Mondays), from 12pm-6pm on Tuesdays and Wednesdays, 11am-7pm on Thursdays and Fridays, 10am-5pm on Saturdays, and 11am-5pm on Sundays. Good evening ladies and gentlemen, and welcome to Ate by Ate’s first tribute to what I call, “The Introduction to Cupcake Central in Toronto”, also known as Queen Street East. 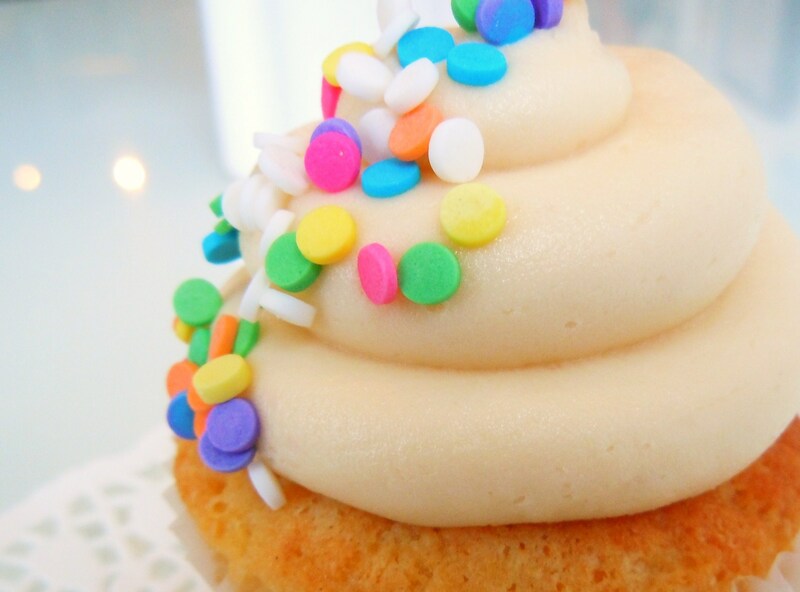 Oh yes, there is a cupcake district in Toronto. 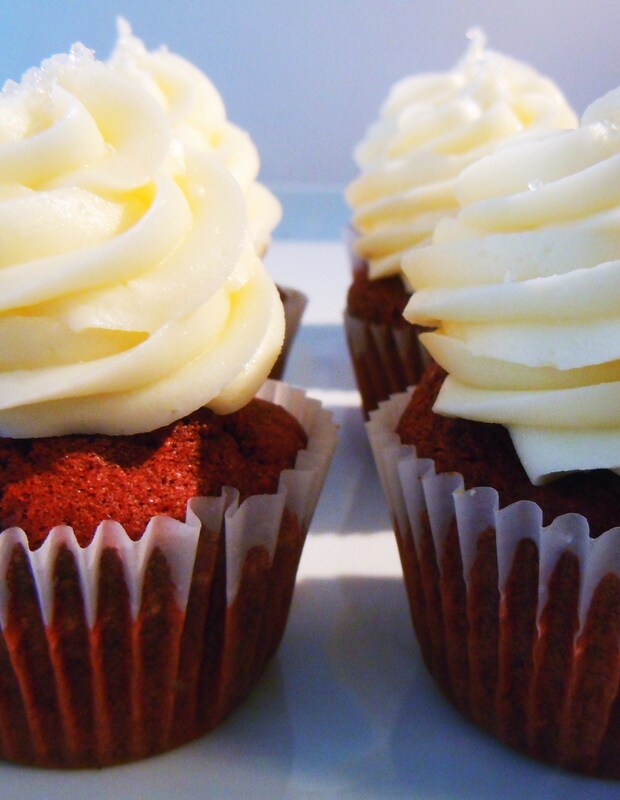 There are 7, count ’em, SEVEN spots to stuff our faces with cupcakes on Queen Street East: Desmond & Beatrice, Bobbette & Belle, It’s the Icing on the Cake!, Sweet Bliss Baking Company, Altitude Baking, Yoshi’s Sweets, and Life is Sweet. And I am going to sweep my way through them if it’s the last thing I do! Even though I’ve known about the magical land of cupcakes that is Queen Street East for what feels like forever, it has taken me months (well, actually, who am I kidding – it’s taken me over a year) to get my sweet teeth to the concentrated district of frosting and sprinkles and while I wished my fairy wings had landed here sooner, this first cupcake experience at Desmond & Beatrice was well worth the wait. 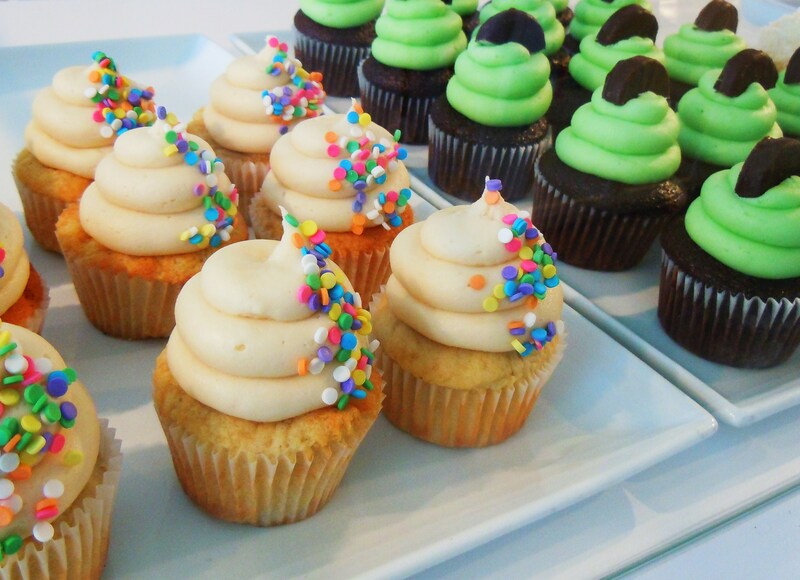 I have been on Queen Street East – in the Beaches, in Leslieville, in Riverside – numerous times, but cupcakes have always evaded me for one reason or another. I ate a cupcake somewhere else earlier in the day. I was too full from brunch or lunch. I opted for a shortbread cookie and macaron from Bobbette & Belle during my first Christmas visit to the classy sweets boutique. Blah blah blah. Two weeks ago, I made it my mission to get myself a cupcake from Queen Street East, specifically from Desmond & Beatrice, and to enjoy every sweet cake crumb morsel and lick of frosting. NO MORE EXCUSES. And so begins our sweet and delicious journey on Queen Street East. 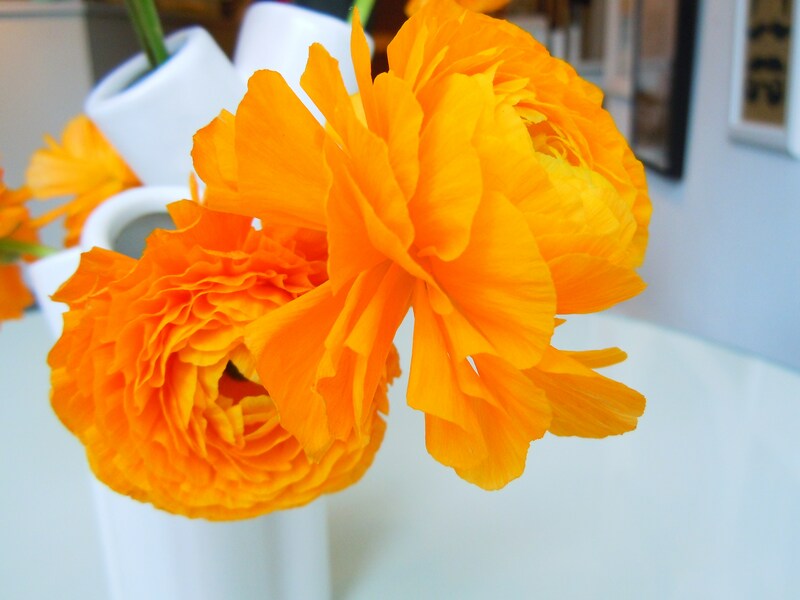 This is the photo spotlight Part I post of II – enjoy the photos!